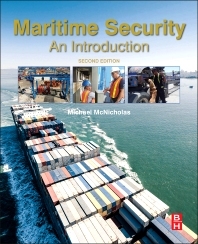 Maritime Security: An Introduction, Second Edition, provides practical, experience-based, and proven knowledge - and a "how-to-guide" - on maritime security. McNicholas explains in clear language how commercial seaports and vessels function; what threats currently exist; what security policies, procedures, systems, and measures must be implemented to mitigate these threats; and how to conduct ship and port security assessments and plans. Whether the problem is weapons of mass destruction or cargo theft, Maritime Security provides invaluable guidance for the professionals who protect our shipping and ports. New chapters focus on whole government maritime security, UN legal conventions and frameworks, transnational crime, and migration. Updates throughout will provide the latest information in increasingly important field. Michael McNicholas is the Managing Director of Phoenix Management Services Group in the USA, Panama, and Costa Rica, Operations Support Services (Panama), and Pathfinder Consulting, LLC in the USA. Michael has over fourteen years of distinguished and progressive Law Enforcement, Military, and Intelligence experience and, most recently, twenty years as Founder/Co-Founder of several successful professional security services corporations in Latin America and the USA. A former Non-Commissioned and Commissioned Officer (Direct Presidential Appointment) in the US Army, Mr. McNicholas served for nine years in Airborne Infantry, Military Police, and Military Intelligence units. Mr. McNicholas held a TOP SECRET security clearance in the Central Intelligence Agency (CIA), where he specialized in counter-narcotics trafficking and international terrorism and served on the Vice President’s Narcotics Interdiction Task Force and as the CIA Liaison to US Coast Guard Intelligence. Michael designed, implemented, and managed the internationally-acclaimed seaport security program at Manzanillo International Terminal – Panama, the largest container port in Latin America. In 2003, he spearheaded the successful efforts to have Phoenix Management Services Group designated as the first “Recognized Security Organization” (RSO) by the Republic of Panama and the Dominican Republic. On behalf of the government of Panama, Phoenix evaluated and approved/rejected Ship Security Plans for over 2,500 ships in the Panama Registry. In the Dominican Republic, Phoenix conducted Port Facility Security Assessments and wrote the Port Facility Security Plans for two of the primary ports in the country. Mr. McNicholas is credited with co-pioneering the Maritime Security Team (Anti-piracy/stowaway/drug trafficking/terrorist) concept in commercial cargo shipping and has Maritime Security Teams deployed onboard container and cargo ships in the Caribbean Sea and Pacific Ocean.